This striking combo image of Venus’ dynamic south pole was released today by the European Space Agency on the tenth anniversary of its Venus Express mission. It’a mess. ESA’s Venus Express spacecraft was launched on the 9th of November 2005. After a 153-day journey to the planet, the space probe spent eight years in orbit around our neighbour, before the mission ended in December 2014. One of the mission’s aims was to study Venus’s extremely dense atmosphere, composed almost entirely of carbon dioxide and sulphuric acid, and to collect data of its dynamic behaviour. 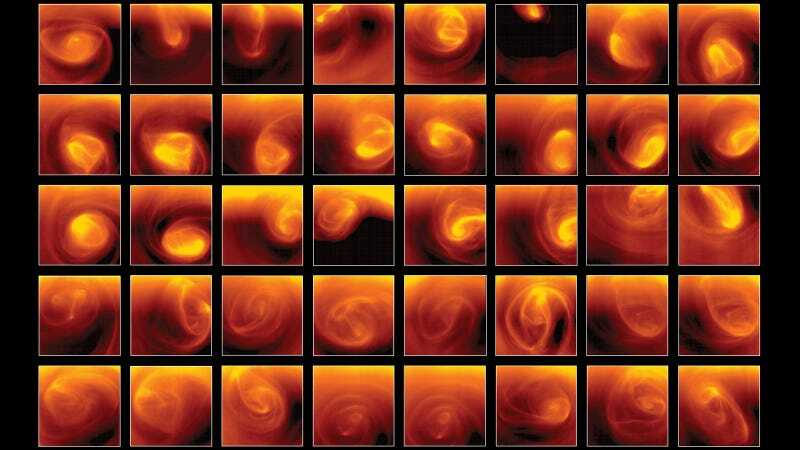 Venus Express has shown that the polar vortices of Venus are among the most variable in the Solar System. The shape of this vortex core, which typically measures 2000–3000 km across, changes dramatically as it is buffeted by turbulent winds. It can resemble an ‘S’, a figure-of-eight, a spiral, an eye, and more, quickly morphing from one day to the next. Each of the images in this frame is roughly 4000 km across.